FILE - A newspaper reading "Gbagbo and Ble Goude finally out!" is seen in Abidjan's popular Yopougon district, a day after the International Criminal Court freed former Ivory Coast president Laurent Gbagbo and his aide Charles Ble Goude, Feb. 2, 2019. "Mr. Gbagbo is now released under conditions in Belgium," an ICC spokeswoman said, without giving further details. FILE - Former Ivory Coast President Laurent Gbagbo appears before the International Criminal Court in The Hague, Netherlands, Jan. 15, 2019. 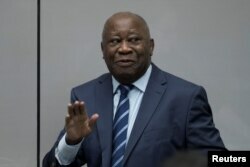 Belgian Foreign Minister Didier Reynders said on Saturday that there had been "a request from the court to host Mr. Gbagbo simply because he has family in Belgium: his second wife, a child in Brussels." "We have concluded that it is alright for him to stay in Belgium while on conditional release," he said, adding, "There will be surveillance."